Back To School Tips…For US! HOWEVER, I think I failed to mention (repressed?) in my previous post about Phase 4: The Panic Phase. Apparently it occurs right about…*glances at watch*, one week before school starts up again. How will I get up with an alarm 5 days a week? Will my brain work again? Am I ready to take on breaking the cycle of poverty and closing the achievement gap from my janitorial closet? their kids with a smooth back to school transition. I am reposting it now, but this time, with notes for US. 1) Mark your calendar with important dates. Ok, so we all know the important dates, like that looming FIRST DAY OF WORK one in our iCals or old skool planners. But let’s also mark the holidays, shall we? 2) Buy school supplies early. Try to fill the backpacks a week or two before school starts. No problem, right? Retail therapy. It’s good. It does help the B2S transition for me to get all new supplies. Oh sure, I’m hemorrhaging money right now because of Target and Office Depot, but I feel more ready to return to school having a trunk full of Moon Sand, new play therapy games, and an unreasonable amount of new writing utensils. 3) Reestablish the bedtime and mealtime routines at least one week before school starts. Include pre-bedtime reading and household chores if these were suspended during the summer. Gak! That means this week I cannot stay up until midnight watching United States of Tara and sleeping in? I do not like this. Not one bit. But I’ll do it. I’ll do it for the children. 4) Turn off the TV. Encourage your child to play quiet games, do puzzles, color, or read as early morning activities instead of tv. This will help ease your child into the learning process and school routine. If possible, maintain this practice throughout the school year. 5) Visit school with your child in advance if your child is young or in a new school. Oh hell no! I am not visiting the district office or my school sites. I remember them well. 6) Designate a clear place to do homework. Read: designate a clear place to write psychoeducational reports/grade papers/lesson plan. Ok, that’s fun, and may involve me purchasing that great Mid-Century Modern secretary desk I’ve had my eye on. 1) Let your child know you care. If your child is anxious about school, send personal notes in the lunch box or book bag. Reinforce the ability to cope. I am going to tell my husband to put notes in my test kits that I will have to lug around. 2) Do not over react. If the first few days are a little rough, try not to over react. 3) Acknowledge anxiety over a bad experience the previous year (e.g. bullying, difficulty with academics or making friends). Contact the school to confirm that the problem has been or will be addressed. Hm. N/A, for most of us, I hope! 4) Arrange play dates or get-togethers with some of your child’s classmates before school starts and during the first weeks of school to help your child reestablish positive social relationships with peers. Oh yeah, I got this one. My school psych friends and I have been taking weekly walks together all summer. It is good to remember that you will see your super-colleagues again soon and get to socialize. 5) If problems arise, you may want to contact the school to set up an appointment to meet with your child’s teacher and school psychologist. They may be able to offer support or suggest other resources. Oh, that’s me. Um, yeah, I guess I need to work on sprucing up my janitor’s closet to be ready. 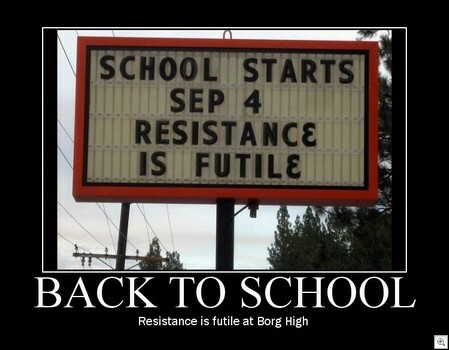 Here’s hoping for a rodent and vermin free school year! Please, please, post your own Back to School Tips. I am in Phase 4 just thinking about it. Comments on Back To School Tips…For US! #3-Perhaps you can contact the school to see if a room bigger than your closet is available. Or to give an eviction notice to the vermin and rodents. Ahh.. it's good to hear stories from peeps who are on a traditional calendar! I only have one week between school years, YEA! It's the worst part of the school year! Don't get me wrong, I LOVE my year round calendar but I do miss my summers when I hear everyone else talking about it. @Corio0717: I have always wondered if a year round school would be secretly awesome. I could get behind the extra time off in Fall and Spring, but I do love me some summer.. I hope that your space IS in fact free of any pests. I love your article and am looking forward to hearing more about your book. I have been enjoying your blog over the last year or so. It has helped me clarify my potential paths. Hi, I have been flirting with the idea of going back to school for a Masters of one type or another doing something psychology related. My two top choices are School Psychologist or MFT. It seems like it not much of an issue to be a School Psychologist with just a Master’s level degree and a School Psychologist certification. In your particular position that you currently hold, if you do not mind me asking, was it necessary that you had a PHD? And if not, do you feel that inspite of your not needing the PHD it has help you nevertheless? Lastly, I am a man. Do you think a male would feel out of place in School Psychology or made to feel out of place by School Admin, teachers, and parents? @Mike. I'm an overachiever–you don't need a Ph.D. to practice school psychology. But you do need one in most cases to do private practice, so that is one reason I went for the advanced degree. Plus, I thought I'd sound fancy. 🙂 Also, our school district has male school psychs and it isn't an issue. They are not plentiful, but they are there. I can't speak to a male perspective on how they feel in a predominantly female profession, but I don't think it really matters as much as how you are with people and kids in general. Good luck deciding. @Sioux: The belly shelf! Such a horrible visual! I love it.